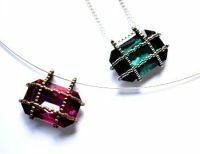 Learn how to create these versatile eye-catching pendants (which are also perfect as earrings) using this 17-page instant download. 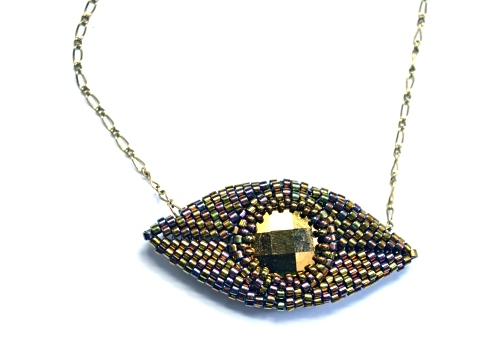 Using peyote stitch discover how to make a reversible pendant which can be worn in 4 different ways depending on the variation you choose to create. Mix and match centrepieces to play with the reversibility of this design and create two different looks for the beading time of one. 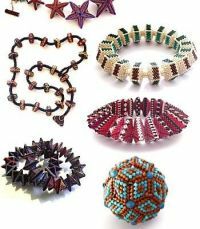 This project using peyote stitch and geometric beadwork to create the 3-dimensional shape and is more suitable for non-beginners. 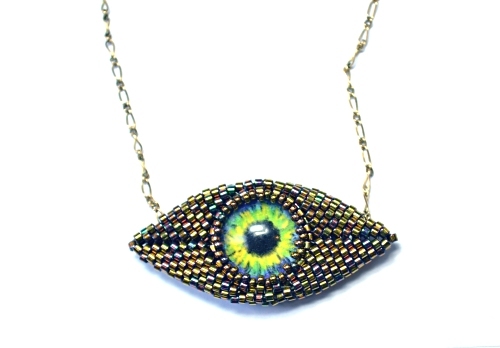 To create my pieces I used a mix of 14mm round Swarovski rivolis, 14mm glass eyes I purchased from John Vidakovic on Etsy and 14mm Swarovski item 2025 (round flatback chessboard crystals) which I purchased from here but do ask for them in your local bead shop. 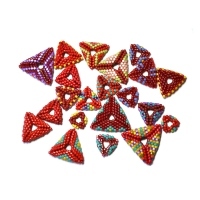 You need either 1 x 14mm rivoli or 2 x any 14mm flatbacks along with size 11 cylinder beads (Delicas, Aikos etc) and size 15 seed beads.